Liberty Biberty: First Day at School! I arrive late but Happy Birthday Liberty! Good luck at school! enjoy it! Aaaaw, she looks so grown up and efficient and CUTE! Have a great day, Liberty. Aava sends her love and is soooo jealous, her pre-school starts in mid-August and she's waiting for it really excited already. The little girl is a big girl sudenly! How cute! I love seeing the new little kids in their over-sized uniforms! She looks ready for school - hope she has a lovely time! How does your school year run? Ours starts in Sep, and goes to end July, so for me it sounds weird that she's starting now! Oh my goodness, sooooooo cute. Like Jo, I just love to see them in their uniforms when they 1st try them on. Especially when they are slightly too big..lol! Muaaaaaah, Liberty, that's a flying kiss from Auntie Susan! Liberty looks so cute in the photo! I love her smile, her darling glasses, pigtails and that very big dress! Hope she has a great first day at school! She looks so happy... How cute!!! I hope both of you have a great school year!!! 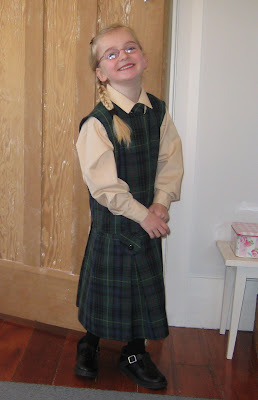 She is such a beautiful girl..and she looks so cute with her school uniform! In Holland the kids have no school uniforms,I think it is a good idea...it would be nice I didn't have to struggle every morning with choosing an outfit to wear for her she don't like! Liberty looks so adorable! I hope her first day at school was great! She looks adorable...so grown up.